I finally managed to work on this pumpkin bread after a long break from bread making. Since I missed the kneading so much, I made this loaf all by hand, although the bread can be easily done entirely by the bread machine (if you omit the pumpkin seeds and egg glaze). I was attracted to this recipe when I came across the illustration of this golden round loaf in the book, Bread, Baking by Hand or Bread Machine. My replica is way too far from the original photo, as the top was almost burnt! Even though I had placed the oven rack to a lower position, the bread rose high and mighty and almost hit the heating elements that are located at the top of my small oven. Luckily, I managed to spot the slightly burnt smell, and quickly "tent" the top of the loaf with a sheet of aluminium foil. I find this so hilarious!! That's one of the joys of baking, isn't it?! You never know what you get until the entire thing is done! Bring a large pan of salted water to the boil. Add the pumpkin flesh and simmer until soft and cooked through, about 20 mins. Drain the pumpkin and reserve the cooking liquid. Mash the pumpkin thoroughly, and sieve, or puree in a food processor or blender, about 2 mins. (I didn't sieve or puree the pumpkin as it was already very soft and fine.) Leave the pumpkin puree and the reserved cooking liquid to cool. Add honey to 60ml of the cooking liquid and stir to dissolve. Mix flour and salt in a large mixing bowl. Add in the instant yeast and mix well. Make a well in the centre and add in the honey liquid, followed by the pumpkin puree. Mix in the flour to form a firm, coarse, sticky dough. If the mixture is too dry, gradually add one or two tablespoons of the pumpkin liquid (or water). (I added extra two tablespoons of liquid). Place dough in large clean bowl and cover with a tea towel or cling wrap. Leave to rise until double in size, about 1 to 1.5hrs. Knock back the dough to release the air, then leave it to rest for 10mins, covered. Shape dough into a round loaf. Place on an oiled baking sheet and cover with a tea towel. (I used a round 20cm baking pan instead). Prove until double in size, about 1 hour. Brush the dough with egg glaze and sprinkle with pumpkin seeds. Bake in pre-heated oven at 220 deg C (I set mine to 200 deg C) and bake for 40mins until golden-coloured and hollow-sounding when tapped underneath. Leave to cool completely before slicing. Mmmm.. just want to slather a big slab of butter on it!! Yumms! Good, now I have someone who tests out bread recipes! I am still waiting for my breadmaker to arrive so that I can get back to baking my own bread! Luckily my daughter and hubby love bread! Heehee.. your bread looks like the little white 6-legged dog in this alien cartoon on Playhouse Disney (the one where the alien looks like a caveman with no mouth and they always visit a foreign planet). The first photo is sooo lovely! I feel like the bread is 'smiling' at me, saying 'eat me eat me' ;). Wonderful job!!! I really enjoy your blog. So generous with information and such nice pictures! The bread look so good and reminds me of homemade bread, been so long I make bread! Definately a bread for Halloween!!! Put it next to a carved pumpkin - wah! Nice! How abt we trade? I made orange yoghurt cake today so u give me some of yr bread and I give u some cake. Perfect breakfast hor? Sigh, if only we live close to each other! Anh, thanks, by the way, it also reminds me of a giant hamburger bun too, lolz! Ellena, you have not seen the photo of the pumpkin bread from the book...I bet you will fall in love with it! 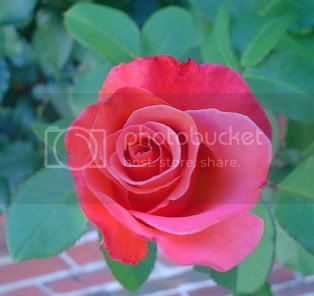 HHB (lucky your moniker isn't Happy Dedicated Baker... LOL), do you mind if I link you in one of my posts? I made the lemon yoghurt cake and would like to share your story. hi ka..t, sure, thanks for linking me :) I'll love to read about your lemon yoghurt cake...oh, I've got another yoghurt cake recipe which I would probably try next week! I've chanced upon your blog recently and attracted by your mixed berries muffin. My muffin turned out with a flat and crunchy surface and it didn't raise at all. I wonder if these are the correct steps?? 3) Did I bake too long at a 220 deg C for 20 minutes with preheat at 220 deg C? 1) You should mix the flour until it just incorporates into the batter, the batter should be lumpy...DO NOT mix till smooth without lump. 2) You can fill the muffin cups to 3/4 full...depending on the recipe, if the batter is thick, you may fill up to almost full...but if the batter is thin, just 2/3 full will do as it may over flow. 3) As different oven is different, you will need to check by observing...the muffins should be done if the top turns golden brown and a skewer(or toothpick) inserted into the centre comes out clean. Hi Sue Sue, it's so nice of you to give me the Creative blogger award! I am so delighted, and yet, I must say I'm not a creative person ;) but thanks so much! Your's pumpkin bread looks yummy! I love this loaf. It looks beautiful with the pumpkin seeds on top and its happy smile. It looks delicious, too. I love pumpkin bread so I will try the recipe. The pumpkin seeds really make it look attractive. Hi Violette, I can't wait to hear from you after you have tried it! Interesting! When I think of pumpkin bread, I think of a dense brown gooey bread that's almost like a honey cake. Who would have thought it could mean something entirely different? 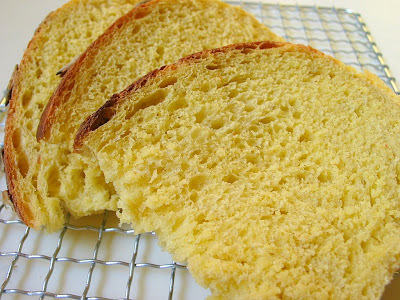 I'm so impressed by the fluffy texture of this bread. It looks very delicious ! Or maybe try roasting the pumpkin or butternut squash with some brown sugar in the oven for a sweeter flavor? Have a good day and continue baking. I love reading your blog and looking at your bread pictures! Hi Hanna, thanks so much for your sweet comments and your useful tips on how to spice up the bread :) I will try it out the next time I made this bread! Did you knead the bread till it is smooth and elastic and not sticky? I guess the bread turned out dense because of under kneading. This is delicious, I made it yesterday. Thanks for the recipe. I really love your blog and those really beautiful photos. I can't help but try out making the bread myself even though I don't have a bread machine. 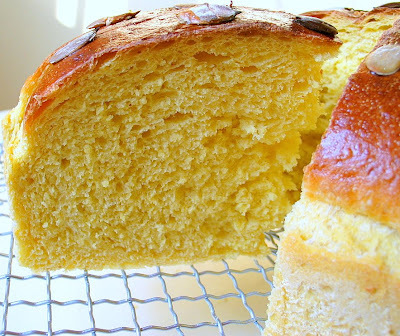 So far, have tried making your milk loaf and pumpkin bread. I even modified your milk loaf into milk pretzel. Both the milk loaf and pumpkin bread turns out a little dense in the middle, do you know what's wrong? I suspect it is due to the kneading, or you could have underbake the loaf. As there are many factors affecting the outcome of the bread, could you provide more details on how you went about making the bread? For the pumpkin bread I think I could have under knead it as I got exhausted after 10 minutes. I could also have under bake it as I set the oven temp to 200 degree cel and baked it for just 30min as I was worried the skin get burnt. Hi Boringtazz, so I think it is likely due to the kneading. You will have to knead the dough until it is very smooth and elastic. For the milk loaf, I usually have to knead by hand for 30mins. Thanks Happy Homebaker, will definitely try it again. I tried this recipe and it turn out great eventhough I just knead for a short 5 mins ( like Artisan Bread in 5 mins). I made into small buns and it's not dense at all. Thank you for the recipe. 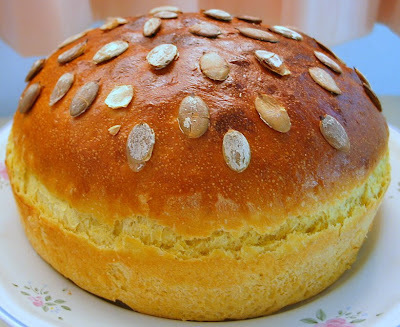 wow your pmpkin bread looks so delicious and healthy~ i want to ask that the pumpkin weight should be use is 500g or 300g?? Janetan, 500g is before removing the skin, 300g is the actual weight of the pumpkin flesh to be used, that is with the skin removed. thanks a lot.. i'll try then let u know the result.. I just tried your recipe today. After 30 min of kneading, the dough still feel slightly sticky tho it does not stick to the hand. Is it still under knead? I also forgot to add salt to the water before boiling the pumpkin and simply took remove them with a spoon before mashing instead of draining. Would that affect the dough. My bread is not as light and fluffy as i would like. Pls advise me, a newbie. Thanks. Hi, you can do a window pane test to check whether you have knead the dough well. Take a piece of dough and stretch it...you should be able to stretch it into a thin membrane without tearing. If the dough tears easily, then it is not well kneaded. 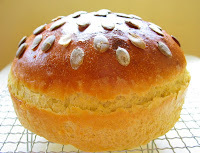 I think your bread is not as light and fluffy because it is not well kneaded, not so much with draining the pumpkin. I tried out ur recipe on Pumpkin Bread and just want u to know that bread turned out good as well, though not as soft as the one on "Back to Basic". Thank u very much again for ur kind sharing of the recipe. I am also surprise to learn that though ur food blog is very outstanding and professional but u r actually a very down to earth person who possessed little baking gadgets but contributing enormously good recipes to people like me, a novice in picking up baking. I hv much to learn from u, esp. on the cake recipes. Hi HHB, there goes again, u r very humble. I love the cream cake recipes in ur blog as they contained little butter. Instead, the whipping cream (less fat compare to the butter) is my favourite way to eat cakes. I will slowsly try out ur recipes, one after another, and let u know the results. BTW, u mentioned that u like chiffon pans without 'legs' which is opposite to my preference. Cud u share why w/o legs is preferable by u? I thought those sold in Phoon Huat 16 cm (brand: Glory) w/o legs but the centre tube is rather short for inverting. The chiffon pan I bought from PH is not the Glory brand. In fact this type of pan w/o legs have got longer tubes and they appear to be deeper (u may refer to the pic I posted on my latest post on Sakura Chiffon) than those with legs. I think the one you saw is not a two-piece chiffon pan but a one piece savarin pan? Also, those with legs dont come in 17cm pan size. 20cm cakes are too big for my family as most of the time I am alone with my two kids. The 16 cm chiffon tube pans I saw at PH were the 2-pc type. I think the one featured on ur latest sakura chiffon is the latest type of tube pan (matt finish) which I saw at Gim Him Lee and commanding a higher price at around S$9.00/pc. than those PH or Gim Him Lee normally stocked in the past. When I saw this pan at Gim Him Lee, my impression was it's bigger than the normal 16 cm and I did not buy it because then it will be a little big for my small chiffon (I always bake small chiffons). I still prefer the 16 cm chiffon pan comes with legs but with long tube which is available at Joo Chiat area. I even got one at S$4.00 and I am going to buy one more next week. I can even change the tube pan into 'spring foam' pan by getting a pc of s/s plate base so that I can use it for cheesecake baking or for baking that requires a springform pan. Varsatile isn't it? Thnx for ur response. Gim Hin Lee at Haig Rd (Geylang area) which represents Bake King brand of bakery products. The small chiffon tube pan sold at GHL is S$9.30. Some heartland kitchenware shops are selling as high as S$10 or S$11. I went to PH Bencoolen but did not find any small chiffon tube pan (the model u hv, probably sold out). I bought another two 16 cm chiffon tube pans at the same shop at Joo Chiat. I simply love the ones with legs. And when once I've found the right size stainless steel flat plate, I can double it up as cake pan. With the legs, I can invert the cake after it is baked. One other thing, I find ur cake and bread recipes rather healthy because they are of low butter content. Most of ur birthday cakes are adorned with whipping cream which I find it to be healthier compare to cakes ladened with butter. Whipping cream aside having lower fat content also looks more delicious and beautiful on cakes. Hence, I shall start using ur birthday cake recipes in the near future. Thank you once again for all ur sumptious and beautiful recipes. Hi, HHB. Thanks again for yr lovely bread recipe, my family loved them so much. My pumpkin bread was soft but the crust came out hard. I used oven to baked this, normally my loaf crust will be hard but when i baked bun, it is ok. What should i do? I thought of reducing the temperature but worry it will underbaked or should i shorten the time? Hi sun sun, maybe you can cover the loaf with foil to prevent the crust from turning hard? or bake at a lower rack?